UK Decay to launch new single @ Electrowerks – Chain D.L.K. 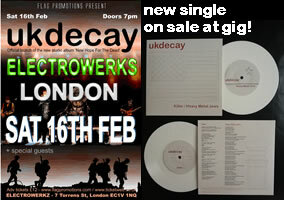 UK Decay are proud to launch the first single for over thirty years at the forthcoming Electrowerks gig on Saturday February 16 2013. Produced by rock demigod Chris Tsangerides the new 7″ single is called “Killer/Heavy Metal Jews” and there are 500 copies only. It will be available on white vinyl, with artwork by acclaimed Italian artist Franko B. There shall be a small amount for sale on Saturdays show for fans and friends as a pre release without bar code. Tickets are still available, but are selling fast (EEE Tickets) Delay in album release down to roaring of sleeve design on vinyl. Its going to be very special…… Luton, May 10th More info soon….